Greetings to all our Village plant enthusiasts. Welcome to the latest “Plant of Interest” article for 2016!! This week we’ll be looking at a striking member of the Asteraceae (Daizy). 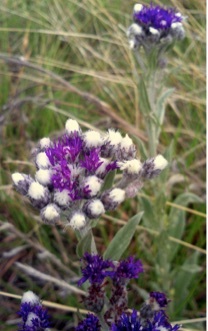 Vernonia natalensis (Silver Vernonia in English, ileleva in Zulu) is an erect perennial herb, obtaining a height of 100cm. It is widespread from the Eastern Cape to Limpopo, growing mostly on grassy slopes in montane, high elevation areas and has been recorded at up to 2000 m A.S.L. This lovely specimen was photographed on our Porcupine Trail in the Clarens Nature Reserve. It usually occurs in clumps, but may also be found as colonies. It is dormant during winter, but flowers from as early as August in warmer cycles, through to December. The beautiful silver leaves of V. natalensis are lanceolate; undulating with the margins slightly rolled inwards and velvety to the touch. The leaves measure on average 40-60mm long by around 5-10mm wide. The dainty purple-pink flower-heads measure up to 10mm wide; are branched and appear flat. White tufted buds are often interspersed between the florets, giving rise to new flowers. 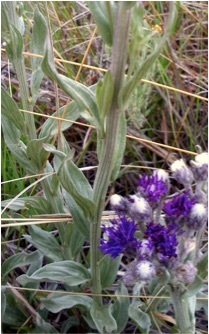 Purple stigmas also contribute to the frilly appearance of this species. Butterflies, beetles and bees have been recorded visiting V. natalensis flowers in the CNR. The seeds with their hairy parachutes are dispersed by the wind. This plant makes for an eye-catching ornament in gardens, and can be propagated from seed or grown from cuttings. This versatility makes it an obvious choice for the amateur gardener. Reportedly, the roots and leaves of V. Natalensis have been used as a charm against lightning. As traditional medicine it is used to treat coughs, headache, and internal pains. It is an ingredient in medicines to ensure a healthy baby, although a variation of this is sometimes used to induce abortion. Several species within the genus are used as herbal teas. Regarded as of Least Concern by SANBI on account of its stable presence throughout its distribution.